How to get rid of mildew smell - Only 1 Simple Ingredient Needed! We have a quick and easy solution for how to get rid of mildew smell and bring the fresh back, and you only need one ingredient. You will be amazed at how fresh everything smells. It is so simple! Ew! Do you ever grab for that fresh towel and get a not so fresh smell? It happens. After prolonged use, those towels not only lose their freshness, but they begin to take on a less then appealing mildew smell. Yuck! This is one of our house cleaning tips and tricks that you do NOT want to miss. You only need one ingredient — vinegar! Yes! Only one ingredient. Can you believe it? Trust me! I love tips and tricks that are this simple. No complicated things to do or buy. No breaking the bank. Just one simple ingredient and such an easy process. You will be amazed! It’s not time consuming so no worries about this taking hours. Truly the vinegar in the washing machine does all the work! 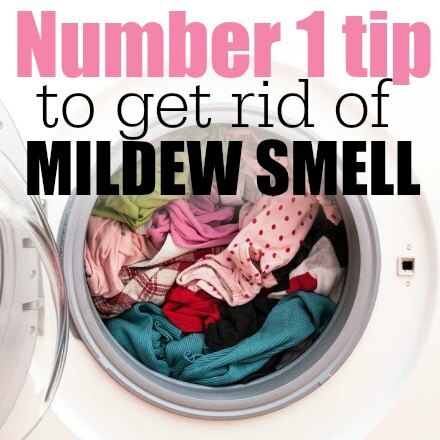 It works to get rid of mildew smell! 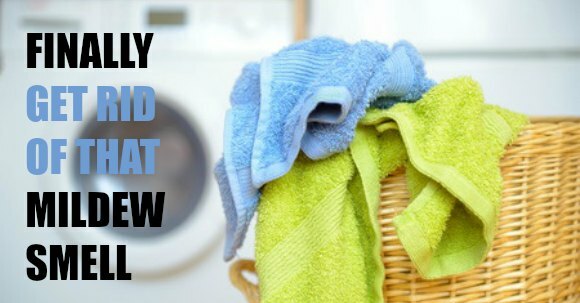 Learn how to get rid of mildew smell in clothes and how to get rid of mildew smell in towels! After reading my posts on different ways to use Vinegar, you know I love using vinegar around the house, but it actually works great on clothes and towels. There are so many uses and this is probably one of my favorites. How do you get rid of mildew smell? The next time you notice your towels are getting musty, wash them in HOT water and add about 1 cup of vinegar to the wash. Just add the vinegar the way you would normally add your detergent. Many people suggest only adding vinegar to the wash and not using detergent. Well, I really am sensitive to the smell of vinegar (who isn’t, really?) so I washed my towels with the vinegar AND my normal detergent. White vinegar works perfect to remove the mildew smell. The affected area will be totally free of mildew odor. So cool! This also works to remove odor from clothes if they have a musty smell. The mildew smell from clothes and the mildew smell from carpet can be annoying. Use a spray bottle to put directly on the area of the carpet to help the odor in your home. Allow to air dry. If there is a musty odor, it will help to have fresh air. Baking soda also helps absorb odors on carpet. The Mildew Smell was gone! This worked great! My towels came out of the dryer fresh and clean smelling. I also tried this method with a load of clothes I left in the washing machine a little (ok, a lot) too long. It worked great on the clothes, too! So handy! No more mildew smell with this one ingredient. Vinegar has so many amazing uses. Isn’t it amazing that one little ingredient can do so many things? I was amazed the first time I tried this and how awesome it smelled. The clothes were so fresh and clean. The towels smelled like new! What are your tips for how to get rid of mildew smell in your towels? You might also like to try this DIY Shoe Deodorizer Spray. It is simple and easy and gets rid of odors in shoes. ! This DIY Shoe Deodorizer Spray will take care of any lingering odors in sneakers, cleats and more! You will be amazed at how well it works! If you have children, this is definitely a spray to have on hand. You will love all of these tips and tricks. We are really trying to use more natural solutions in our home. This includes cleaning and also personal care items. It’s so nice to be able to use items that are better for us and also save money. I don’t have to worry about harsh chemicals and ingredients I can’t even pronounce. Most of these DIY recipes have very little ingredients. It’s so refreshing to use products that require so little to actually work! Before I started incorporating natural products into our daily routine, I worried it might be complicated or expensive. I soon found out that it’s all pretty easy and actually saves me money! We typically try something new each week and it’s a lot of fun. The entire family gets involved and the kids love to help. Make sure you read how we use vinegar and baking soda together around the house. I think you will be surprised by some of these. Lots of great uses! Vinegar is so inexpensive so it’s really awesome that it works on so many different things. Let us know what you try and what is your favorite thing to use vinegar for. I use it for so many different things that it would be hard to choose only one. Also read my post on how to get those old towels feeling fresh again. Replace fabric softener with vinegar when washing towels. It will eliminate odor, soften towels and keep them absorbent.